Safespring Compute has two volume types available, fast and large. It is possible to migrate between these volume types using the API or the UI. The volume has to be detached from any instance for the migration to work. Please make sure to unmount the volume from within the instance before detaching it. The volume will be detached from the I/O subsystem of your instance, so not removing it properly could cause a "hard" disconnect, with risk of data loss. Find the correct volume using the Volumes tab of your compute project. 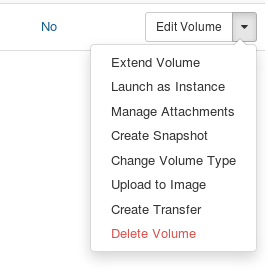 Select Change Volume Type in the pulldown menu for the volume you want to migrate. The volume service will now copy the volume from the old backend to the new. Depending on the size of the volume, this operation will take some time.